Rodent Damage - Welcome Coffee Growers! A: Recently severed coffee verticals from rat chewing; one of them still hangs from the plant. marks on the woody tissue of stems in A. C: Rats also feed on lateral branches of coffee (white circle). D: Rats may feed on the green stem tissue of coffee verticals. 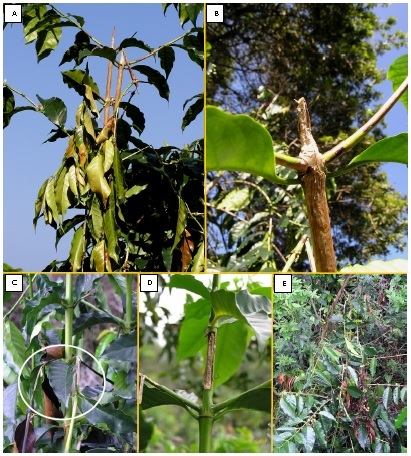 E: Several hanging and dead verticals on a coffee plant which was planted next to a forest. Rodents, particularly rats, can cause damage to coffee branches by gnawing on the pith and cambium to feed on the moisture and nutrients within the branch. Dr. Scot Nelson has information on rat damage to coffee and other crops in a past Hawaii Coffee Quarterly issue as well as in a CTAHR publication titled "Rat-feeding injury to plants in Hawaii". Click on these links above to learn more about rat-feeding plant injury and for rat management strategies. Learn how to best collect and submit disease, insect pest and nematode samples to the UH Agricultural Diagnostic Service Center (ADSC) for diagnosis. Click here for ADSC analytical service fees.